Samuel Marshall Raimi (born October 23, 1959) is an American film director, producer, and writer. He is best known for directing the classic cult-horror film The Evil Dead and the blockbuster Spider-Man films. Raimi was born in Royal Oak, Michigan to a conservative Jewish family of Polish ancestry; his father was Leonard Ronald Raimi and his mother was Celia Barbara Raimi. His family's original surname was Reingewertz, but was shortened to Raimi after his grandfather immigrated to the United States. His father's close cousin was Harry Margolis who played for the St. Louis Cardinals in the 1941 season. Raimi is the fourth of five children. His eldest sibling, Sander, died in a swimming accident in 1968 at age 15, while on a trip to Israel. He attended Michigan State University and majored in English. He became fascinated in making films when his father brought a camera home one day and he began to make Super 8 movies with friend Bruce Campbell. At college, he teamed up with his brother's room-mate Robert Tapert and Campbell to raise money for a low-budget horror film. The Evil Dead (1981) became a major hit and he began work on his second film Crimewave (1985), intended as a live-action comic book - the film was not successful, due in part to unwanted studio intervention. Raimi returned to the horror genre with the seminal Evil Dead II (which toned down the savageness of the original in favour of slapstick, showcasing his love of the Three Stooges). A long-time comic book buff, he attempted to adapt "The Shadow" into a movie, but was unable to secure the rights. So he created his own super-hero, Darkman (1990). The film was his first major studio picture, and was only moderately successful, but he was still able to secure funding for Evil Dead 3: Army of Darkness, which turned away almost totally from horror in favour of fantasy and comedy elements. In the 1990s Raimi moved into other genres, directing such films as A Simple Plan (1998) (starring Bill Paxton and Billy Bob Thornton) and For Love of the Game (1999) (starring Kevin Costner). Raimi achieved great commercial success with the blockbuster Spider-Man (2002), which was adapted from the comic book series of the same name. The movie has grossed over $800 million USD worldwide, and has spawned a sequel. Raimi is currently working on Spider-Man 3, and has signed up to direct a film adaptation of The Wee Free Men by Terry Pratchett afterwards. Prior to directing the Spider-Man films, Raimi lobbied to direct Batman Forever when Tim Burton was ousted from the director's chair, but was rejected in favor of Joel Schumacher, whose reputation at the time outshone Raimi's. Rumored to be producing a big-screen version of comic hero The Shadow next. In addition to film, Raimi has worked in television, producing such series as Xena: Warrior Princess, featuring his younger brother Ted Raimi and long-time friend Bruce Campbell, Hercules: The Legendary Journeys, American Gothic (TV series), and Jack of All Trades. He has just agreed to direct a TV mini-series of Terry Goodkind's novel Wizard's First Rule. In his film and television projects, Sam Raimi's brother Ted Raimi and his friend Bruce Campbell often appear in on-screen roles, though these appearances are often just short cameos. Raimi often works with fellow Michigan State University alum, film editor Bob Murawski (editor of the Spider-man series of films, The Gift, Army of Darkness). Sam Raimi has included a 1973 yellow Oldsmobile Delta 88 automobile (nicknamed "The Classic") in most of his films. A bottle of Maker's Mark also appears regularly in his movies. Other director trademarks include: a distinctive type of camera shot where the camera follows a moving object such as an arrow at high speeds in first person or side view; dolly zooms; and shots of smoke or fog in the first few minutes of most of his films. 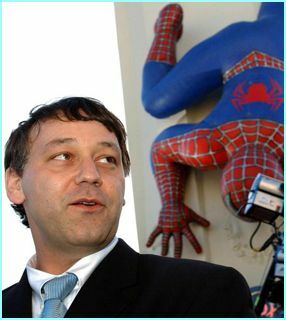 Sam Raimi's films have often used montage sequences to show a lengthy set of actions in a short space of time. Raimi is married to Gillian Greene, the daughter of actor Lorne Greene. They have five children. On occasion, Raimi collaborates with his elder brother, Ivan Raimi, who works as a doctor. Together, they co-wrote the screenplays for "Darkman" and "Army of Darkness". Ivan also contributed to story and script development for the three "Spider-Man" films. Raimi donated totally $900 to George W. Bush's presidential campaign in 2004.